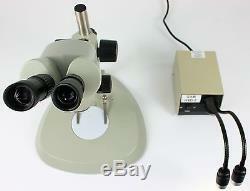 GX Microscopes MZS Series Professional Ultra-Long Working Distance Stereo Zoom Microscope - 195mm Working Distance. The MZS series of ultra-long working distance (of 118mm up to 195mm) professional stereo microscopes are GX Microscopes most popular zoom microscopes for applications where work needs to be undertaken on the subject under observation. This includes the electronics industry, jewellery manufacture, engraving, component assembly work, soldering, dissections and live sample work. A highly versatile stereo zoom microscope, the MZS and is an excellent, professional grade instrument for industry, hobbyists, researchers and educational establishments. This microscope also produces an unusually high quality image to the camera and is often the microscope of choice among customers requiring really good images of their specimens. With over 1,000 installations in the UK alone, they provide the highest quality, remarkably long working distance, wide field of view images, a wide zoom range and are highly robust and extremely well built, suitable for the most demanding uses. The binocular eyepiece tubes are inclined at a comfortable 45º. The entire head can be easily rotated through 360º, it has interpupillary distance adjustment and both eyepiece tubes have diopter adjustment. This makes these microscopes suitable for ergonomic use by the greatest number of people and assists in achieving parfocality when cameras are attached. Magnification, Eyepieces & Objective Quality: Each microscope in the MZS range is equipped with a pair of 0.7X - 4.5X zoom objectives controlled by a zoom knob and a pair of 10X extra wide-field eyepieces and this listing also includes a 0.5x auxiliary objective/lens. Each eyepiece links directly to one of the angled zoom objectives, this gives a stunning 3 dimensional image of your specimen. The optical quality is exceptionally good giving a bright, crisp 3D image of the specimen. The optical quality is very high giving a very bright, crisp 3D image of the specimen. The combination of the 10x eyepieces, 1x objective set and 0.5x objective set (all included in this listing) provides the following magnification range: 3.5x - 45x. Focus Mechanism: The head of the microscope sits in a focussing ring, this ring can be mounted on a very wide variety of stands including pillar stands and articulated arm stands. The focus ring has a precision, smooth focus system using a rack & pinion mechanism. Stand: This listing includes a pillar stand with adjustable focus. Illumination: Illumination is provided by a pair of Dual LED Gooseneck Light Guides. Included in the Kit: MZS binocular microscope, pair of WF10x eyepieces, a pair of rubber eyeguards, 0.5x objective, manual, dust cover, dual gooseneck LED illuminator. Optional Accessories: The GXCAM Camera makes an ideal accessory for this microscope for those interested in snapping photographs of their samples. Please see our shop for more details. 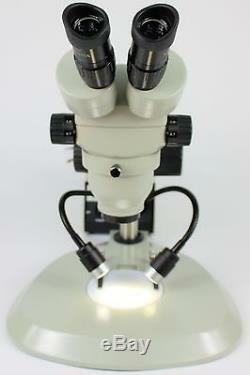 Applications: The MZS Microscope range is highly versatile and is an ideal option for. Hobbyists, including entomologists, plant identification/dissection, etc. Jewellers, including gem inspection/identification, diamond setting, display microscope, etc. Zoom Range 7 - 4.5x. Total magnification: 3.5x - 45x. Objectives: 1X (built-in) & 0.5X. 118mm Working Distance with Built-in 1x Objective, 195mm with 0.5x Objective. Illumination: LED Dual Gooseneck Light Guides. 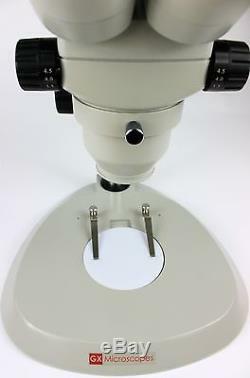 GX Microscopes Brand by GT Vision Ltd Product ID0153, ID0668, ID3812. 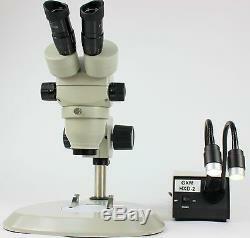 Stereo Zoom Microscope (also known as dissecting microscope & low magnification microscope). Pair 10X Widefield eyepieces (FN=23mm). Binocular Head, can be rotated through 360deg. Interpupillary distance adjustment, inclined head at 45deg. 76mm focus ring with coarse focus on a pillar stand. LED Dual Gooseneck Light Guides. Cameras can be attached down the eyepiece tube. 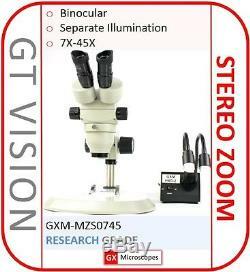 The item "GX Microscopes 45x Binocular Long Distance Stereo Zoom Microscope withLED Lights" is in sale since Monday, December 08, 2014. This item is in the category "Business, Office & Industrial\Medical/Lab Equipment\Lab Equipment\Microscopes". The seller is "gt-vision" and is located in Haverhill. This item can be shipped to United Kingdom, to Austria, to Belgium, BG, HR, CY, CZ, DK, FI, to France, to Germany, GR, HU, to Ireland, to Italy, LT, LU, MT, to Netherlands, PL, PT, RO, SK, SI, to Spain, SE, to Australia, to United States, to Canada, to Japan, to New Zealand, to China, IL, to Hong Kong, NO, ID, MY, to Mexico, SG, KR, to Switzerland, to Taiwan, TH.